me+2makes3......and we make a family: "The Italian Princess"
"Really? I had no idea "Italian Princesses" worked 60 hours a week and filled the rest of their time with laundry, cooking & cleaning! I also didn't know Italian Princesses have the same wardrobe for 4 years with the expception of a few items because they deliberately buy timeless clothes to get the most use out of them! And I definitley didn't know Italian Princesses drive 10 year old trucks because it is paid for and I intend to drive it until I have to pick it up and run with it Freddie Flinstone style! and I'm SURE Italian Princesses go get mani/pedi's on a regular basis unlike myself who managed to spill a bottle of red nail polish on my COUCH trying to save money on a pedi. (I got it out-Thank Goodness!)" Disclaimer: Robert read this and is forcing me to inform you that HE got the stain off the couch cushion with about a week of hard work. He also said, I'm still an Italian Princess. 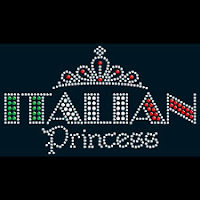 Hey, I can't say I wouldn't love to be an "Italian Princess", but there are definitley no Italian Princesses in this house. Colleen - I love you!!! You are so funny.